Philippine Airlines has introduced its new e-ticketing facility for booking domestic flights. Effective 10 August 2007, we are using 2 systems simultaneously. The New! Low Fare Calendar Search which is available for domestic itineraries only and the current Low Fare Search by Schedule for International itineraries or combination of International/Domestic Itineraries. This applies to Domestic Itineraries only. You may now check the low fare across a seven day period or the low fare for your exact travel date. For International itineraries or combination of International and Domestic itineraries. You will be shown the best internet fare applicable to your preferred travel date. I tried booking for a return ticket to Puerto Princessa using both systems. Surprisingly, there was a difference in the ticket prices. With the old system, the fare quoted was Php 6,873.00, inclusive of taxes. Using the new domestic booking system, the same itinerary only costs Php 5,210. Moving the departure date from a Saturday to a Sunday, I was even able to get a RT ticket for only Php 3,082. That’s a great price, isn’t it? The thing I like best about their new system is that it shows you the available fares for each day within the week, which makes it easier to look for fares that would suit your budget. Of course, if you’re getting fares this cheap, there’s a drawback: can’t earn miles. 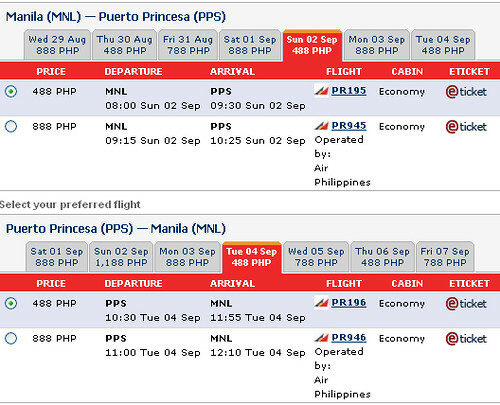 Mileage accrual or not, Php 3,082 for a return ticket to Puerto Princessa is a pretty good deal. I tried the same two booking dates with Cebu Pacific. For the first one (Saturday – Tuesday), the fare I got was Php 6,453.44! It costs almost as much through PAL’s old booking system. For the next itinerary (Sunday to Tuesday), the tickets cost Php 3,506.72, still higher than that of PAL’s. Comparing their taxes, it looks like Cebu Pacific is charging higher taxes than PAL. Where as PAL is charging Php 2,106 for the 2nd itinerary, Cebu Pacific is charging Php 2,230.72. Okay, so there’s minimal difference. But still, interesting. hey ur welcome. i knew u’d like that tip. if u need any tips in puerto princesa just e-mail me. if it’s ur first time that is. clean small town with great food and tourist-friendly and law abiding people (parang wala ka sa pinas). i miss puerto already. gday! dyanie: Aba aba aba! Inggit ako! Philippine Airlines online booking policy is stupid. Whoever heard of any airline asking the credit card owner to photocopy his/her credit card and ID and send it to his/her friends/relatives whom he booked their ticket online? Its a violation of credit card security/privacy. what if someone get a hold of the photocopy of the credit card (i.e. email hijacking, or those thieves in our post office)? or the friend/relative misplaced/dropped it accidentally? Sayang wala pang seat selection feature!